← Should He Stay Or Should He Go Now??? TT is averse to free agency, but this could be the year he breaks that trend. Let’s be honest, talking free agency strategy with Ted Thompson running our squad has been mostly an exercise in futility. The way TT pinches pennies, you’d think he was Mitt Romney’s financial advisor. But, the few times he has dipped his toes in the free agency waters, he’s hit it big by plucking Woodson and Pickett. The Packers have few needs, and free agency might be a good route for TT to fill a need or two. For starters, the Packers have approximately $6.9 million in cap space presently, which includes an added bonus of $1.6M thanks to Jerry Jones and Dan Snyder. That’s not a lot to wheel and deal, and I expect TT to create more cap space in the coming days. The two obvious candidates are DD and Clifton. 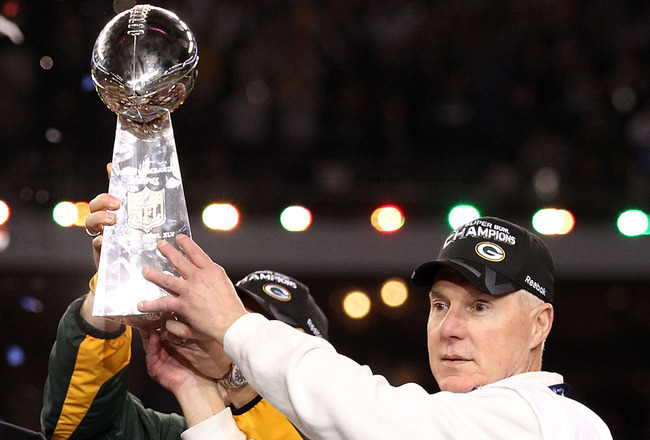 Both players have been great players and representative for the Packers throughout their careers. But, it’s a cut-throat business and the Pack have younger and better players that need to see the playing field in their place – Cobb/Gurley and Newhouse. TT has always been one to cut a player one season too soon than too late (see Cullen Jenkins), and I expect this will be no different. Frankly, I’d love to see TT cut Mr. T-Rex arms (Hawk). I have no clue what the cap repercussions may be in doing so (if you can find this information out, please comment and I will update accordingly), but he’s a dud and replaceable. Regardless, if the Packers handle DD and Clifton, they would be sitting with approximately $12M – more than enough ammunition for TT to get to work in free agency. Even though our defense is in desperate need of some upgrades, the biggest priority in free agency needs to be retaining or replacing Scott Wells. Numerous reports indicate Wells harbors vitriol towards the Packers because they attempted to replace him in years past and refuse to pay him top-5 money for his position. Wells may be in for a rude awakening, though, once he gets to free agency. After all, the same reasons the Packers have continually tried replacing him – short, stocky, and not a road grader – still exist. In fact, his value is probably the greatest with the Packers than any other team because of his familiarity with the system and it being a pass-oriented attack. I wouldn’t be surprised if he ends up resigning with the Packers once he sees his market is not nearly as big as he anticipates. This situation reminds me James Jones from last year in that respect. In the event Wells signs elsewhere, there are a number of available centers in free agency. Chris Myers from Houston is regarded as the best available center. He comes from a zone-blocking scheme and led their top-ranked rushing attack. He’s also over-30, though. An interesting prospect is Samson Satele from Oakland. He’s younger at 27 and anchored the 2nd and 7th ranked rushing offenses the past two seasons. Otherwise, the Pack will have to look to the draft to replace Wells. A pair of Sconnie’s are regarded as two of the best available centers in the draft – Peter Konz (1st round grade) and Kevin Zeitler (guard, but might be better suited for C). Mark Anderson – OLB for the Pats. He resurrected his career with the Pats this past season, recording 10 sacks. At 29, he’s still relatively young and would be an instant upgrade opposite Matthews. He won’t demand top-dollar, either, and would be the savvy, under-the-radar type move that may appeal to TT. Kamerion Wimbley – OLB for Oakland. He’s under contract with Oakland, but his contract will require the Raiders to cut him soon. He’s 28 and is very athletic and talented at 6′-4″ and 255 lbs. He had 7 sacks this past season, and 9 the year before. In six full seasons, he has 42.5 sacks. Needless to say, he’d be a great compliment to Matthews. Unfortunately, his price tag will probably be too steep for TT. Adam Carriker – DE for the Skins. He’s a former high draft pick that hasn’t panned out. But, he’s still only 28, and at 6′-6″ and 315 lbs., he could play at NT or DE in the 3-4. Starting in 15 games last season at the nose tackle position for the Skins’ 3-4 defense, he notched 5.5 sacks. Like Anderson, he’s not going to garner much immediate attention and should come on the cheap. Tracy Porter – CB for the ‘Aints. Tracy Porter happens to be one of my favorite non-Packers player because of this play. Don’t forget, Porter is the player that iced the Super Bowl win with the late pick-six on Manning. He clearly does not shy from the big-moment and, at 26, he’s a player with a lot of potential still in him. Porter’s problem, though, has been staying healthy, having never survived a full season. And because of this, he might come cheaper than a young cornerback with his potential might otherwise. Reggie Nelson – S for the Bungals. Nelson was another former high-draft pick that never made it with his original squad. He’s a safety the Packers may want to target for insurance in case Mr. Pick-Six cannot return. Nelson had a solid season last year with 85 tackles, 4 picks, and 2 sacks and fumbles apiece. Do you sense a theme in the players listed above? It was intentional. Outside of Wimbley, they are players under-the-radar and not splashy. That’s how TT operates, and if he decides to dabble in the free agency pool, expect him to target these types of players – good fits at the right price. But, considering his last foray into free agency was the huge signing of Duke Preston, well, I’m tempering my expectations. This entry was posted in Vikes v. Pack and tagged A.J. Hawk, Aaron Rodgers, Adam Carriker, B.J. Raji, Chad Clifton, Chris Myers, Clay Matthews, Cullen Jenkins, Donald Driver, Duke Preston, Green Bay Packers, Greg Jennings, James Jones, Kamerion Wimbley, Kevin Zeitler, Mario Williams, Mark Anderson, Marshall Newhouse, NFL Free Agency, Packers free agency strategy, Peter Konz, Randall Cobb, Reggie Nelson, Samson Satele, Sconnie, Scott Wells, Ted Thompson, Toni Gurley, Tracy Porter. Bookmark the permalink.